“Hartack was his own man, satisfied only as a winner and finding it unacceptable to be just in the money. He was a top winner throughout his career. Bill was the best to himself and to millions of race goers and he was #1 to me as well." In honor of LeRoy Neiman’s passionate support of Bill Hartack’s legacy, the Hartack Foundation has created the Neiman Award, recognizing the commitment and contributions made to the racing industry by Thoroughbred owners and trainers. Horse Trainer Todd Pletcher won the Eclipse Award seven times as Trainer of the Year, four of these in consecutive years. His horses Super Saver (2010) and Always Dreaming (2017) won the Kentucky Derby. He also won the Belmont Stakes with Rags to Riches (2007), Palace Malice (2013) and Tapwrit (2017). Todd began working for his father, Jake, as a hot walker at the age of seven. During his summers off from high school, he worked as a hot walker for Henry Moreno at Hollywood Park and Del Mar Racetracks. He graduated from James Madison High School in San Antonio, Texas in 1985 and began college at the University of Arizona in their Race Track Industry Program. Between his sophomore and junior years, he worked as a groom for D. Wayne Lukas at Arlington Park near Chicago. He spent the following summer with another legendary Hall of Fame trainer, Charlie Whittingham, working as a groom at Hollywood Park. He graduated from the University of Arizona with a Bachelor of Animal Science in May 1989 and traveled to New York immediately following graduation to work for Lukas as a foreman in the active stable. In 1991, he was promoted to assistant trainer for Lukas, splitting his time between New York and Florida. Pletcher was Lukas’s East Coast Assistant until fall of 1995 where he helped develop horses such as Thunder Gulch, Harlan, Serena’s Song, A Wild Ride, and Flanders. He took out his trainer’s license in December 1995 and saddled his first winner, Majestic Number, in February 1996 at Gulfstream Park in Florida. At the age of 77 Art Sherman became the oldest trainer to win the Kentucky Derby. He began his career as a stable hand. 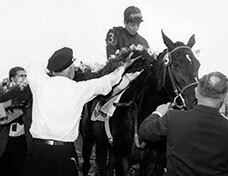 He was the exercise rider for the 1955 Kentucky Derby winner Swaps and 1956 Kentucky Derby entrant Terrang. In 1957, Sherman became a licensed jockey. He began training horses in 1979. Prior to becoming the trainer of California Chrome, Sherman had trained ten graded stakes winners and is credited with over 2,100 wins. He was hired to train California Chrome in 2013. Leading up to the 2014 Kentucky Derby, Sherman had conditioned the horse through four consecutive wins, and California Chrome entered the Derby as the favorite and won. Two weeks later, California Chrome also won the 2014 Preakness Stakes. J. Paul Reddam is the owner of Nyquist, winner of the 2016 Kentucky Derby. Reddum is a two-time Neiman winner. He was also recognized as owner of thoroughbred champion I’ll Have Another, the winner of the 2012 Kentucky Derby and the 2012 Preakness Stakes. Doug O’Neil is the trainer of Nyquist, winner of the 2016 Kentucky Derby. This is O’Neil’s first Neiman Award. As a trainer, he is a two-time Kentucky Derby winner with Nyquist (2016) and I’ll Have Another (2012).